39/53 - are we all wimps? my brother had a ten-speed racer when i owned a raleigh twenty shopper. fate is often unkind. so after leaving college and entering the big, bad world of work, and the cost of stuff, particularly that of petrol, it was time to retrench and get a bike. no shoppers this time round; as a grown up with athletic pretensions if none of the ability to fulfil those pretensions, there was only one kind of bike that would look good in the garage. and that was about the sum total of my bicycle knowledge at the time. no remote inkling about gearing, or wheels or tyres or frames. as long as it had ten gears, all would be well with the world wouldn't it? well wouldn't it? a five speed freewheel (oh those halcyon days of nostalgia) at the back and a couple of rings at the front, rings that at the considerably less than expensive end of the market i intended to inhabit, were made from pressed steel and rivetted together. this way my mechanic wouldn't be overstretched in the options department. options that didn't really exist to be quite honest; if memory serves correctly, the freewheel topped out at 21 teeth, while the chainrings were the international standard 42/52, a combination that did little for the unfit with robert millar aspirations. pedalling from troon to dundonald involved a hill, an obstacle that must have been (and likely still is) a mere shadow of the alpine slopes observed on channel 4, but an obstacle that took a lot of getting over. 42/52 with 14-21; peugeot never phoned. so now i know lots, probably much more than is good for any one person, and certainly enough to bore for britain. i have twenty gears, and those front rings are 5mm allen key bolted to an aluminium spider; these can be altered for the day's ascent should the mood require, and i, along with everyone else, have adopted the de rigeur 39/53, on the off chance that a climb of alpe d'huez proportions is just around the corner that i have failed to turn before. it's unlikely that many consider the rings on their chainset, and with 34/50 becoming ever more common, there is less and less need for concern, since with such a combination, unclimbable ascents must surely be on the wane. but have we all gone soft around the edges? rarely does a week go by when the comic doesn't feature several pages on how to maximise that effort based on recently discovered and hitherto unknown training or nutritional methods. taken at face value, surely such improvements ought to make even recreational cycling a tad easier than it was in the days of 42/52. meaning that the current standard of 39/53 and the trend for compact chainsets is heading in the wrong direction. surely? so in order to test this theoretical stratagem based on sound nonsensical principles, i contacted chicken cycles, importers of ta specialites chainrings with a bolt circle diameter compatible with campagnolo chainsets. why so instead of the real thing with vicenza stamped on it? well, not to put too fine a point on it, it's a question of cost. i'm as much a fan of original equipment campagnolo as the next obsessive, but with campag rings bearing an rrp nearing £70 ($110), ta's £36 ($57) is considerably more wallet friendly while losing nothing in the mechanical stakes. the idea here was to replace my inner 39 ring with a nostalgic 42, since i already owned a barely used campag 52 outer ring. now bear in mind that this experiment, such as it is, is most certainly not designed to show off any bulging thighs that i might think i have under a pair of bib-shorts, but simply to find out whether the standard of a bygone age (current campagnolo eleven speed offerings are 39/52 or 39/53) had any merits that modernity has overlooked. i can hear the naysayers chorusing (no pun intended) that my place of residence is scarcely angliru country, and i couldn't agree more, but the same could be said for many a domicile in the uk, usa or many parts of europe (i hope you're paying attention ron). however, it would be naive at best to avoid hills and pronounce the experiment an unqualified success, so i rode up a hill; only about 1km admittedly, but it did manage 9% for several metres of those thousand, and it's almost the best i've got. am i converted? well, to be quite honest, i probably am. long(ish) climbs seem ok; perhaps finding a rhythm, is finding a rhythm, is finding a rhythm. the short, sharp ones gave a wee bit more of a problem, or to be precise, required a sudden input of effort, and in most cases, there was only one bail-out gear left rather than two. i have yet to attempt the climb at ardnahoe which tops out at 20%, but i believe i could confidently predict that there would be no gears left and i'd be desperately searching for one. however, the necessity of climbing such on a regular basis is not one that invades my day, nor is it likely to. i suspect the same goes for many of you reading. will i be leaving the 42 in place? yes. with a bit of practice and effort, i could conceivably gain major bragging rights. and even after only a three hour ride in the wet, i'd pretty much forgotten about the extra three teeth. despite not being an official campagnolo ring, the ta was imperceptible in use, changing up or down without missing a step. so maybe we have gone sort of soft, or maybe we've just become complacent and accepting of the manufacturers' dictates. it's obviously quite easy to have whatever rings you fancy on that chainset, and i don't doubt that any shop worth its salt would happily make any changes at point of purchase. so, if you feel of similar mind, let's start a quiet revolution, one that challenges big bicycle brother, and swap that inner ring to a 42. if the outer is 53, i'd just leave it because one tooth is unlikely to make much difference unless you're category two or above. 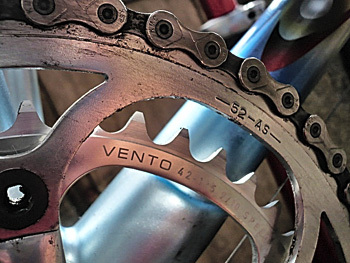 always remember that chainrings are a state of mind. chicken cycles stock shimano compatible rings in addition to the campagnolo compatible ta specialites tested. these should be available from any decent bike shop.